The Elk View Inn has expanded its group capacity with the addition of three new conference rooms available for your next family reunion, wedding, reception, banquet or conference. 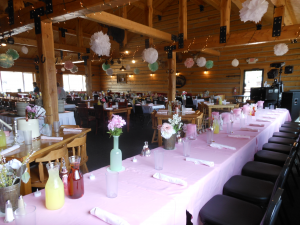 At 8,000 feet elevation, our Ponderosa Pine mountain top location will provide the perfect backdrop for your next special event! We offer lodging, catering and activities for your group in and around the resort. Our main lodge offers a full-service restaurant and lounge. Contact Roberta via email [email protected], by phone 307-752-4444, or by voice mail 307-751-7444 to request information and/or coordinate booking an event, Tour Bus and Educational Tour lunch stops or overnight stays.